Always looking ahead, it’s time to plant spring-blooming bulbs. All they require is a bright, sunny location and a little soil preparation. The best blooms start with loose soil and a few inches of well-aged compost mixed in. Tulips and daffodils should go in six inches deep and six inches apart. If you’re planting a lot of them, get yourself a bulb planter: It’s a tapered cylindrical shovel that digs a bulb-sized hole with just a quick turn of the wrist. 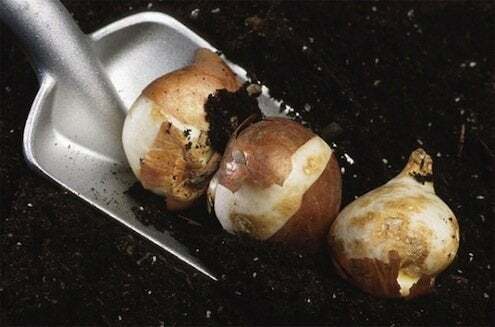 Remember to examine the bulbs before tucking them in—don’t bother using ones that feel squishy or dried out. You can plant through the last week of November, although some gardeners don’t stop until the ground is completely frozen! If squirrels and deer prey on your garden, most retailers have a selection of critter-resistant bulbs to choose from. If you live where it’s hot, store your bulbs in the fridge for a few weeks before planting, as they need to chill for a spell to really thrive in spring.